Sheffi Paz with other South Tel Aviv residents holding placards during a protest march against African asylum-seekers in South Tel Aviv on June 2, 2018. Photo by Miriam Alster/Flash90. (JNS) The Ministerial Committee for Legislation will meet next week to discuss a bill that would give the government the authority to circumvent the High Court of Justice and deport illegal migrants. The proposed legislation, which would give the Knesset the power to vote down High Court rulings with a special majority, was submitted by Justice Minister Ayelet Shaked and MK Shuli Mualem-Rafaeli (both of Habayit Hayehudi). “The override clause will restore the proper balance between the three branches of government,” Shaked said on Tuesday. “The Kulanu Party [led by Finance Minister Moshe Kahlon] has committed to supporting an override clause as long as it is restricted to the issue of illegal migrants. 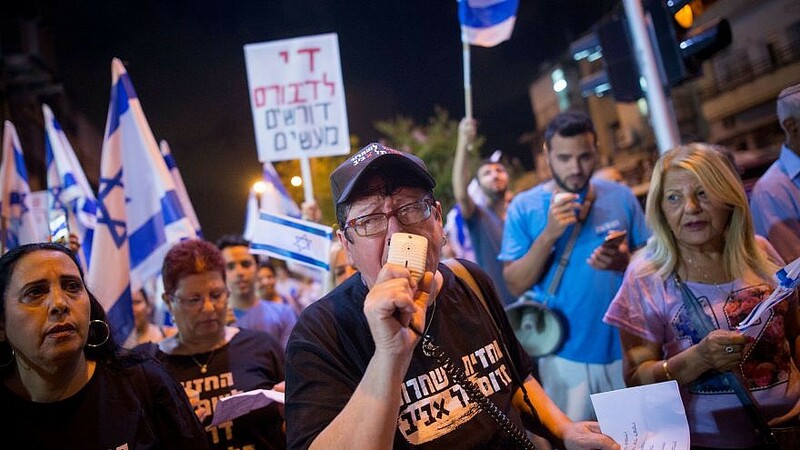 “I hope that the members [of Kulanu] will fulfill their promise to the residents of south Tel Aviv,” she said, referring to the impoverished area where many illegal African migrants reside and where clashes have occurred with local residents. Israeli activists from South Tel Aviv expressed skepticism over the initiative. Israel currently hosts some 35,000 African migrants, mainly from war-torn Sudan and dictatorial Eritrea. Tens of thousands of Africans began arriving in Israel in 2005 through Egypt after Egyptian forces violently quashed a refugee demonstration, and word spread of safety and job opportunities in Israel. The refugees had often endured perilous journeys before crossing the Egypt-Israel border. Israel completed a barrier in 2012 that stemmed the influx, and since then has wrestled with the challenges posed by those migrants already in the country. Many hold menial jobs in hotels and restaurants, and thousands settled in South Tel Aviv neighborhoods. Neighbors have complained about crowding and crime as a result. The Foreign Workers Law, also known as the “deposit law,” was implemented a year ago and allows the government to withhold 20 percent of migrants’ monthly paychecks, to be returned only if they voluntarily leave the country. Migrants and the NGOs that support them say the law is yet another attempt by an anti-migrant government to force them out. In August, Israeli Prime Minister Benjamin Netanyahu instructed National Security Adviser Meir Ben-Shabat to re-examine the issue of deporting illegal African labor migrants back to their home countries. The directive follows a ruling by the Justice Ministry’s Appeals Tribunal stating that with Eritrea planning to cancel its mandatory draft, it would allow the state to send Eritreans illegally in Israel back home.